Garments seem to be flying off the needles at the moment. I showed you the Baby Picchu briefly on Sunday but here it is being modelled by Miss J. This afternoon I was quietly knitting when there was a loud bang outside, on investigation I discovered that there had been an accident. The fourth one in the time we have lived in this house. I took a sneaky photo and this is what the local paper had to say. Fortunately only one person was injured and not too seriously. After that excitement, I did go on to finish the teal cardigan. It turned out a bit on the large size, but then I was using double knit rather than sport weight. So it will be one for her to grow into. I think Miss J. is reminding us all that she's not just a pretty model, you know, she has brains and ambition, too!! you could be right there Liz, she certainly knows her own mind! You've made 2 lovely cardigans there. I really like that teal colour. So glad no one was seriously hurt....and that they didn't crash into your place. 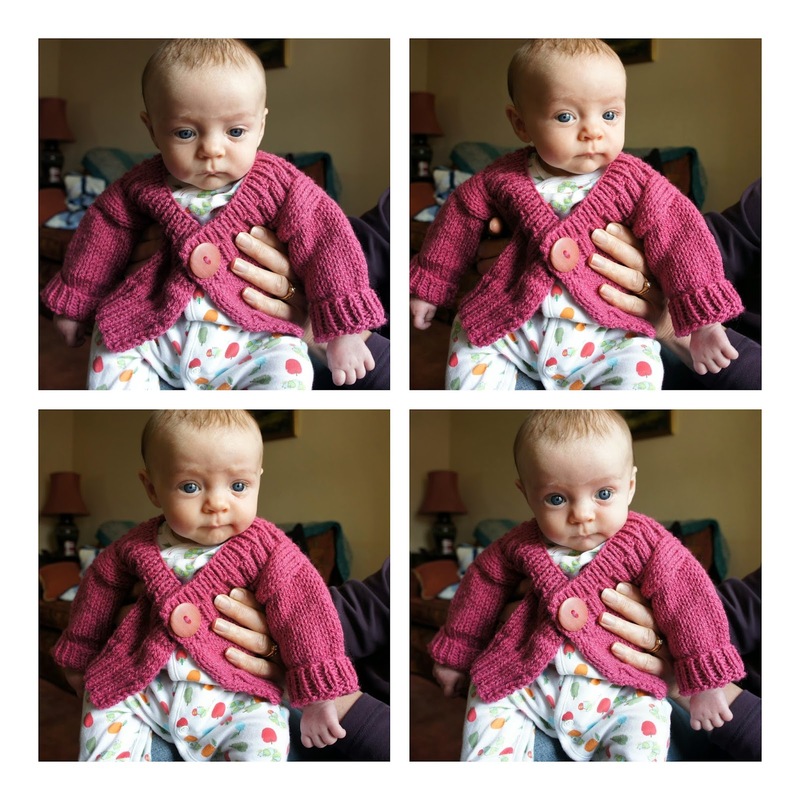 beautiful cardigan that is off the needles, but the finished cardigan on the baby, oh my! love the photo shoot!! I love the photos of Miss J. She looks kind of put upon. A sort of "why me" that turns into resignation by the last photo. Two adorable sweaters. Aww! Cute as a button :) And I love the style of the teal cardi, very vintage and sweet. It's hard to get them to smile for the camera. And now that Lucy is a bit older I am discovering it's also hard to get them to sit still! The Baby Picchu is cute, even without an accompanying smile. I like your short sleeve version of the seamless yoked cardigan, and the colour is very pretty. I knit one one of these for Lucy. It's a great pattern!